I missed The Way We Move when it came out last summer, but with Langhorne Slim (the stage name of Sean Scolnick) and his current backing band The Law set to embark on a lengthy summer/fall tour it seemed like a good time to catch up. My last encounter with Langhorne Slim came through 2009’s Be Set Free, which I found to be an enjoyable slice of Americana that stood out the most during its louder, boisterous moments but didn’t quite maintain the same level of hook during the more subdued ones. This time around there seems to have been a further jump forward in the level of songwriting, as The Way We Move is captivating from beginning to end. Langhorne Slim has had a lot of different musicians backing him over the years, but I think I like this iteration the best. Not to take away from any of the contributions the past lineups have made, but there’s a sense of chemistry between these guys that comes out on the recording and gives additional energy to the material. Stylistically The Way We Move is pure Americana, as it touches upon all of the different musical genres that have a distinctive American feel. There’s some straight up rock ‘n roll numbers, folk and folk rock, and even some numbers that have a country/bluegrass feel. Compared to what I remember of Langhorne Slim’s past material, there seems to be even more variety this time around and a better balance between loud energetic tracks that feature the full band and laid back acoustic numbers. Last time around I found the mellower songs to drag a bit, but the songwriting has taken a step forward on this album as the softer acoustic pieces are just as engaging as the rest of the material. Even at fourteen tracks this disc doesn’t run out of steam, and that came as a pleasant surprise. Scolnick has a voice that has a gravelly edge, giving a slight bit of edginess to an otherwise melodic performance. Over the past few albums he has put out as Langhorne Slim I have noticed that his performance has only seemed to get stronger, and it has reached a peak level on The Way We Move. Previously there was the occasional moment where some of his higher pitches would start to get away from him slightly, but this no longer appears to be an issue and Slim is able to let his voice soar without getting off pitch or losing any energy in the process. Some of the other members provide backup singing during the louder numbers and provide some more depth to the recording, but Scolnick remains the driving force and seems to have fully hit his stride on this release. Langhorne Slim and The Law have put together an impressive effort, and this current backing iteration of the group might just be my favorite yet. 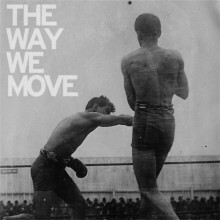 The Way We Move touches upon just about every element that encompasses Americana and offers strong hooks on every track, making it an album listeners will be sure to return to frequently. It’s exciting to see Scolnick reach this level of songwriting and vocal talent, and hopefully it’s a sign of even better things still to come.